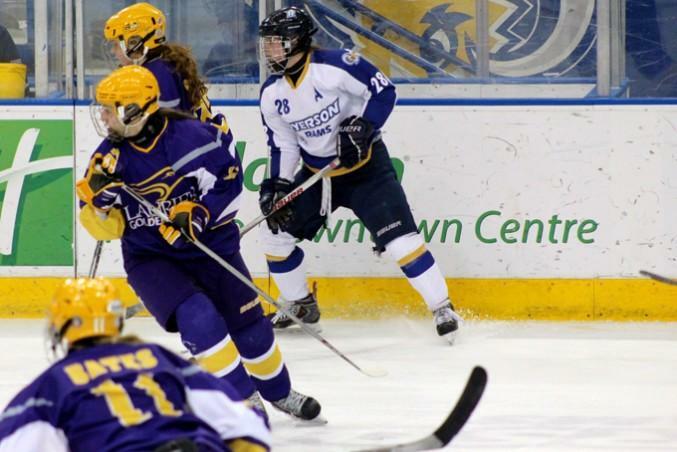 The Ryerson Women’s hockey team (3-0-17-3) lost to the Laurier Golden Hawks (10-3-8-2) 2-1 Thursday night in overtime at the Mattamy Athletic Centre (MAC). Victoria Chapman opened up the scoring with her first goal as a Ram 4:52 into the first period. It was assisted by Cassie Sharp and Laura Ball. Ryerson kept the momentum through the first period, but unfortunately, let down their guard in the second. Laurier made 20 shots on goaltender Alex Armstrong throughout the period, but it took 15:20 for Laurier to capitalize and tie up the game. Ryerson tightened up on defence in the third, allowing Laurier just three shots. The Rams however, were unable to capitalize on the many good shots that were taken, taking the game into overtime. It didn’t take long for Laurier to end the game with a flashy goal scored just one minute into the five minute period. Ryerson will play its last game of the season on Saturday at 2 p.m. at Waterloo.